For the road use a contrasting color of stones or colored sand. 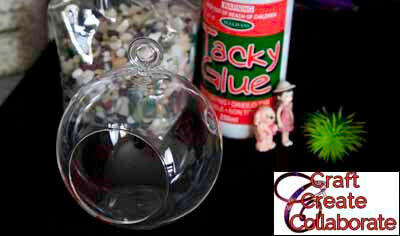 Make the glass bowl clean and shiny to begin the miniature scene. 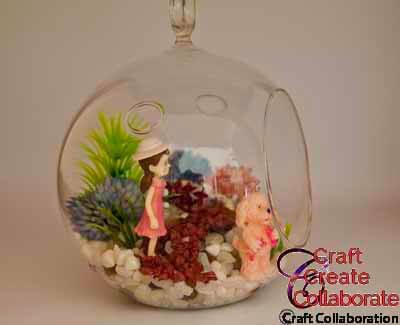 Note: if you can’t find a nice little bowl like this one, these miniature scenes can be created in any clear glass bowl. I have seen scenes made in large wine glasses something like this one. 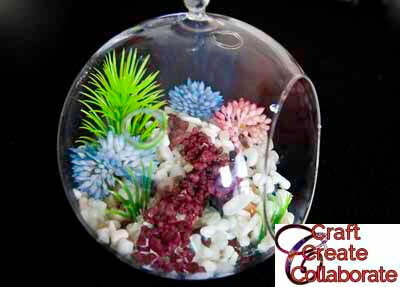 Think about the scene that you want to create and on the outside of the bowl using a whiteboard marker mark things like the horizon and any other significant features. Always try to keep the glass clean, it can be cleaned later but it helps if the cleanup is not too much. 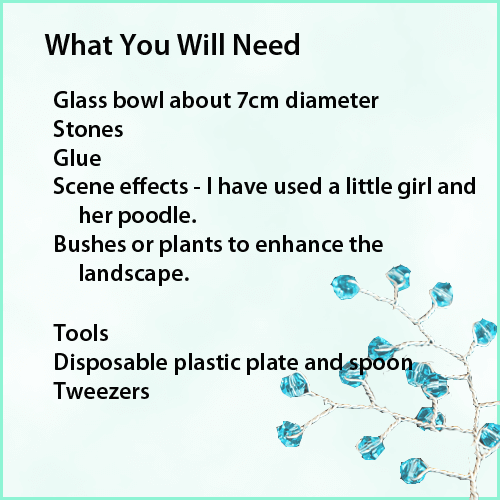 Place around half a cup of stones on the plastic plate and some glue. 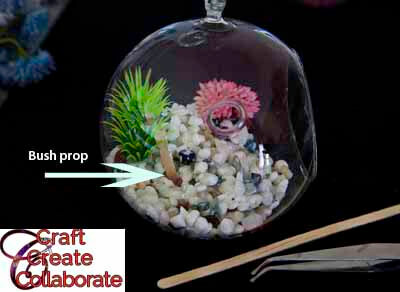 (I use simple craft glue as it does not dry too quickly. It cleans up with water and even after it is dry if the stones are not quite in the right place, they can be removed as the glue is a little flexible.) Make sure that the chosen glue, dries clear. Mix the glue with the stones until the stones are coated. This is the first layer of stones and another layer will go on top when this layer is dry. 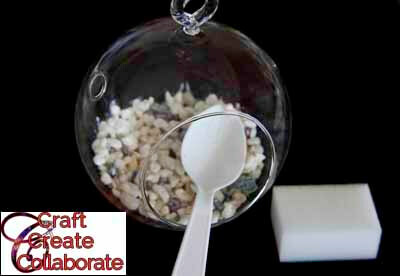 Using the plastic spoon place the glue coated stones inside the bowl and spread them in the design you have chosen. Press the stones down, if the spoon gets too sticky dip it in a little water. Because another layer will go on top of these stones they should be left to dry for around 24 hours so that they dry well. Mix a little more than half a cup of stones with glue, as done for layer one. 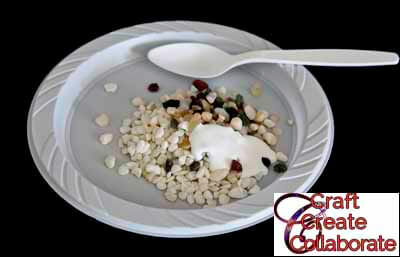 Now use the plastic spoon to carefully place the stones inside the bowl. To add interest, don’t keep it flat, put a rise or a hill towards the back of the scene. Have in your mind where the road and plants are going to be placed. Adding bushes either place them while the stone glue is still wet, or use a stronger glue to hold them in place. I have a clear silicone glue that does a good job. The larger green plant here needed a prop until the stones around it dried a little. The tweezers with an angle (as above) are very helpful in placing items inside the bowl. I also have a pack of craft sticks that I keep in my resources, they have many uses. Through the glue nozzle squeeze glue in the shape of the road, it will take a few lines of glue. Now you can place the stones or sand on top of the glue road. Reaching this point, you have done well. Now for the fun stage, place your figures, in this case, it is the little girl who is looking at the cute poodle. I needed to prop both of these until they dried. 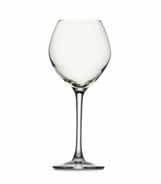 Use the tweezers with a damp sponge to clean up any marks on the inside of the glass. I have found that eucalyptus oil on the sponge makes the glass clear and shiny. 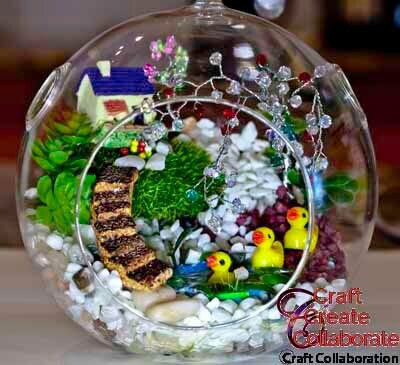 The beauty of these miniature scenes is that they lend themselves to developing imagination. 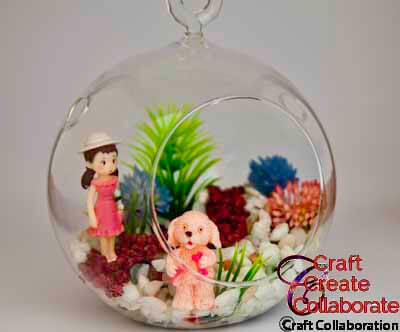 For crafters with children keep them interested as you make your miniature scene. What is the story behind the characters? What names would you give them? What are they doing or thinking? Where are they going? If the cute poodle jumps out of the bowl, will the little girl follow? How does she get the poodle to come back? etc. etc. This miniature scene is in a 12 cm bowl. The scene features a little house on the grassy hill. Stairs coming down to a duck pond. One duck is in the pond the other two are following. On the right, there is a beautiful crystal tree made of 50 crystals and silver wire. The tree adds a lovely touch to the scene, the bottom branches are made on a very fine wire that shimmers with any movement. 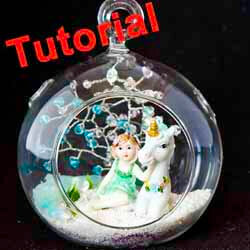 We intend to do a tutorial on making crystal trees. 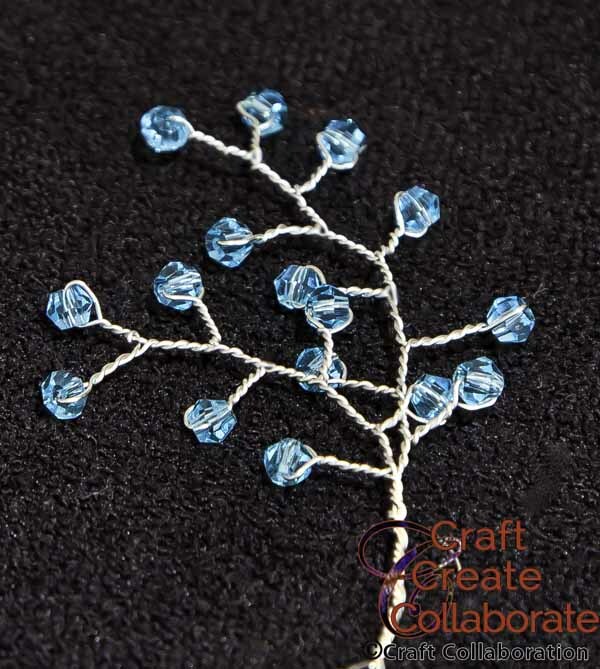 For a start here is a tutorial on making a branch for a crystal tree. If you would like a quote for any item at all, I will see what price I can get it for. 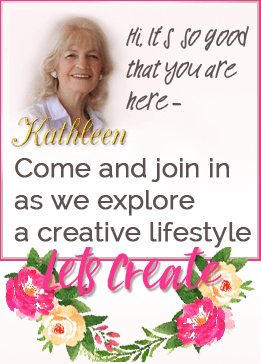 Make your requests in the contact form in the footer, also let me know what country you are in. What a great idea! I love it! I’ve seen these glass containers at Michaels filled with succulents and I almost bought one! 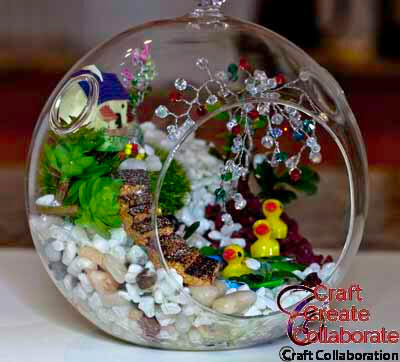 I love the idea of making your own, especially with the cute figures you added! I can’t wait to do fun things like this with my granddaughter. Thank you Amy. I am so pleased that you like the miniature scene. 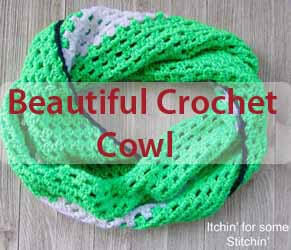 You will love projects like this as that beautiful little granddaughter grows up. Thanks for you comments Wendy. It is a cute fun scene with a lot of potential for enjoyment. Thanks for the sweet comments Charlotte. 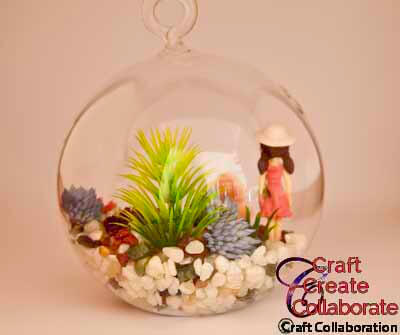 Your kids would love making a miniature garden. 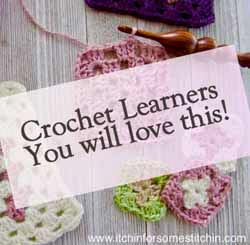 Thanks Sue, I am sure it would be a great project and a bonding exercise with your granddaughter. These are just precious! Thanks for sharing!